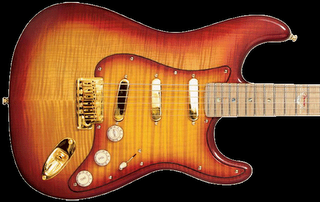 The new Custom Shop section at Fender.com features the beautiful "Russian Strat" by Russian luthier Yuriy Shishkov. The light ash body is capped both with flame maple top and pickguard. Even the pickups are wired by Shishkov. 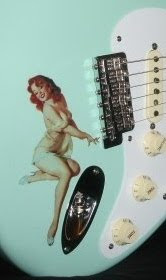 Fender Custom Shop lists this high definition cutie in their "Ltd Dealer Select" category (I totally don't know what that means, but I want it). Click the photo for more details and to visit the rest of the site.